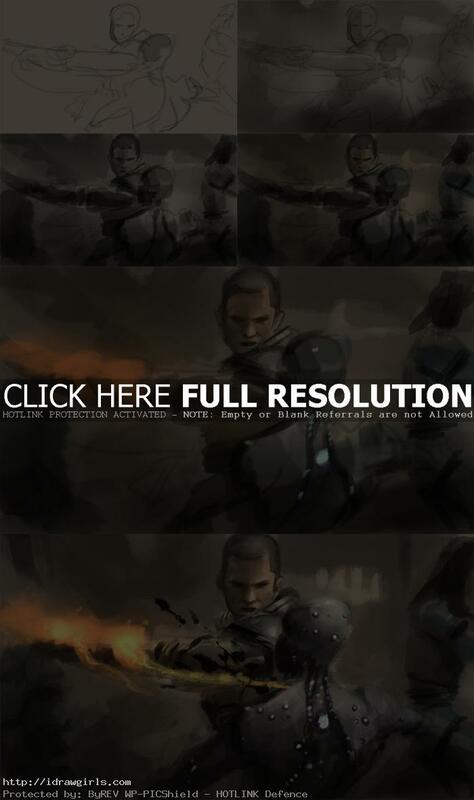 Speed painting tutorial fight scene from Mass Effect. Learn how to quickly paint a fight scene for Sci-Fi video game conceptual art, Mass Effect. In this image, Shepard is slashing a typical Husk creature during the combat scene. Shepard is the main protagonist of Mass Effect. Throughout the game, the player’s decisions can affect Shepard’s personality, consequently changing how both individuals and entire races view him/her and the human race. Key choices can even affect the outcomes of situations throughout the story. Husk are synthetic “zombies” created from the bodies of organic beings. When a human is captured, they are placed on impaling devices, huge spikes. Over time the body’s organs, skin and water content are converted into cybernetic materials; blood is changed to a sickly green fluid, and the body generates an electrical charge. When the spikes are approached the Husks are released and attack. In this tutorial you will learn simple way of digital painting using value then apply color over it. I spend about forty minutes to complete the digital painting. This is the quickest way to paint, I rely mostly on light and shadow to create form for all objects in the scene. This speed digital painting timelaspe video demo series of movie screenshots will help you gain knowledge of shape, value and edges in painting. Learn to draw and paint characters, creatures, and environmental concept design with tips from a professional concept artist and illustrator Xia Taptara. 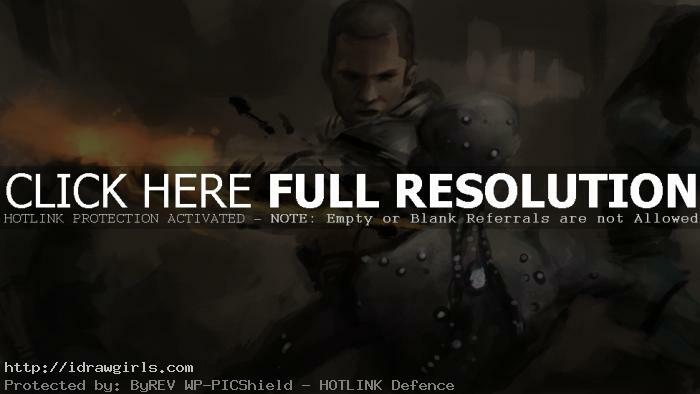 Watch a video of speed painting tutorial, how to paint a fight scene: Shepard vs Husk. Below are step by step speed painting, how to paint Shepard vs Husk. Step one, I just roughly us lines as quick guild to where I will put my value onto the canvas for each character. Step two and three I quickly blocked out masses and shapes. Lighting is often simplified taking advantage of atmospheric perspective. Step four and five, I then added color and arrange them according to the existing value. Details are just loosely and selectively indicated. Then I can use texture brushes to define edges to the painting as well. It is very common with speedpainting that artists start out with no or only a very rough idea about where to take the painting. Subject matter evolves from simplicity to playing with edges. Concept Artists usually do them in the very early stages of production, study or as a warm-up exercise. I really love your channel and more so now that I am in college and working on building my portfolio. You Sr. have inspired me to focus my imagination, thank you.